W4WOW, was the Amateur Radio Station located at the Science and Technology Museum (Scitrek) in downtown Atlanta, Georgia. It's trustee was W4QO, Jim Oats, former president of the International QRP Club. he's currently an active member of the the North Fulton ARL. In it's heyday it was located at corner of Piedmont and Pine Streets, next to the Atlanta Civic Center. They relocated to Atlanta's Fernbank Science Center after being purchased by the Turner Broadcasting System (TBS), who donated it to Fernbank. It closed in 2004 due to lack of funding. It was transferred to Valdosta State University in 2005. It is now only an educational center for teachers and students. More here. It's not much of a legacy, but it's something. More images here. In the context of those changes it's hard to say exactly when W4WOW shut down. 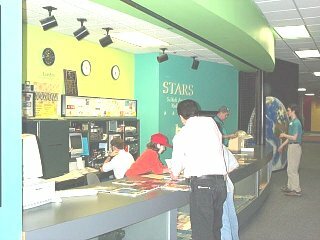 SciTrek, the Science & Technology Museum of Atlanta was founded in 1988. they launched a website in 1997 which thankfully was cached by the wayback machine at the Archive. Because of that I know that the museum had pretty normal hours: Monday through Saturday from 10:00 AM to 5:00 PM and on Sundays from 12:00 PM to 5:00 PM. 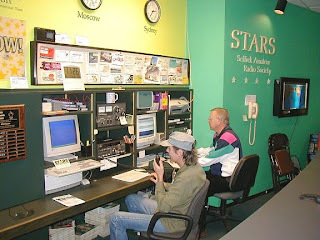 But their radio program called STARS (SciTrek Amateur Radio Station) was only open "most days" from 11L00 AM to 2:00 PM. In an archived page they had a short description of the hams that ran the program. "The station is operated by volunteers. Many of them are also members of some of these clubs throughout the Atlanta area: the Quarter Century Wireless Assn - QCWA, the North Fulton ARL , Gwinnett ARS, the Atlanta RC, and the Metro Atlanta Telephone Pioneer ARC - MATPARC." Antennas: Cushcraft A-4, 6m beam, 2m beam, WARC dipole - all at 70 feet or higher, GAP vertical, multiple VHF/UHF antennas. By December of 2001 it was a once-a-week program the last archived page before the move to Fernbank reads "Visit SciTrek every Saturday from 12:00pm-3:00pm to learn how to operate a HAM Radio Station and communicate with individuals around the world." I presume that the move to Fernbank was near the end of the program.